Net Weight: Packet (250 seeds)1oz (1600)(+$6)1/4lb (6400)(+$9)1/2lb (12800) (+$15)1lb (25600) (+$20) This item is currently out of stock! This medium sized, early variety produces globe shaped purplish-red roots and good sized tops. 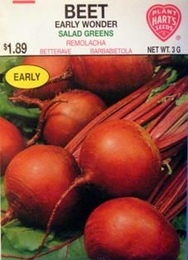 Good for fresh use, canning or pickling as well as greens, this early beet is especially productive where seasons are short. Young Detroit Dark Red beet tops make excellent greens either cooked or fresh which are used like Swiss Chard and can be grown all summer. Roots are 2 1/2 to 3 inches in diameter.